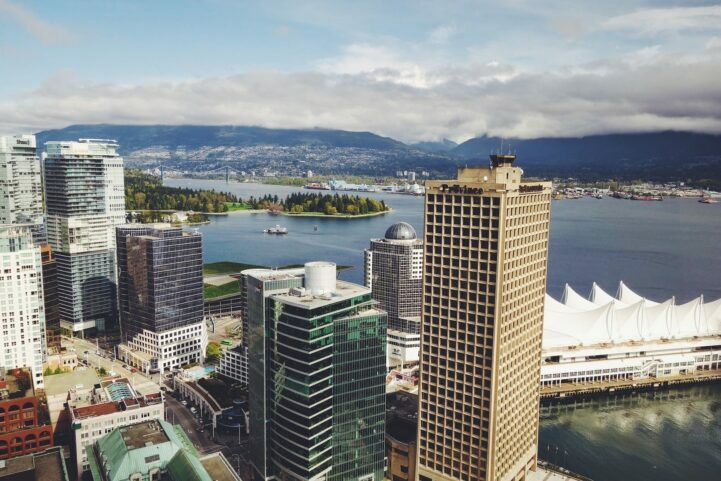 Canadian real estate sales contributed to a significant hit to the Canadian economy. Statistics Canada released January’s Gross Domestic Product (GDP) numbers, showing a decline in output across the country. Special attention should be paid to the real estate categories, which are printing the largest declines in years. Canada saw GDP numbers decline for the first time in five months. Total GDP reached $1.760 trillion, a 0.12% decline from the month before. The 12 month change is still 2.72% higher than the same time last year. GDP numbers are seasonally adjusted, meaning month-over-month changes are important. Source: Statistics Canada. Better Dwelling. Confused whether the decline is a big deal or not? There’s no real definitive answer after just one data point. Although, a decline from December to January is rare, having occurred only twice in the past ten years. The two times it occurred may be telling of the kind of year we’re looking at – 2009 and 2015. Both years saw Canada hit a recession, though 2015 was a barely noticeable blip for most. A recession is defined as two consecutive quarters of GDP decline. One of the largest sectors dragging down GDP was the category “real estate and rental and leasing.” Output for the classification came in at $227.6 billion in January, a 0.49% decline from the month before. The 12 month trend was 2.31% higher than the same month last year. This is the most direct of the categories that make up the real estate portions of GDP. The size of declines are worth noting, since these are multi-year records. The monthly decline is the largest since October 2008. The 12 month change is positive, but the growth is the lowest observed since April 2013. Once again, it’s only one month, but it’s a big change. Statistics Canada made a special note regarding the “output of offices of real estate agents and brokers.” Output came in at $10.03 billion in January, a 12.75% decline from the month before. The 12 month trend also showed a decline, with output 6.19% lower than the same month last year. The monthly decline is the largest since November 2008. This is one of the primary reasons for the decline in the “real estate and rental and leasing” category. Statistics Canada attributed January’s real estate losses to new OSFI B-20 Guidelines. The Guideline reduces the maximum size of a mortgage, obtained from regulated banks. That reason doesn’t make sense, since the numbers are seasonally adjusted. Seasonally adjusted output doesn’t necessarily occur in the reported month or quarter. Since the Guideline only applied from January 1, 2018 forward, the output would have been minimally impacted in these numbers. However, don’t let that ruin a simple explanation for a complicated issue. Huge decline in sales this year in Toronto, about 30% for three months now. Since Toronto is almost 30% of all sales in the country, this is going to hit GDP hard. Remember, GDP numbers only include commissions. I watch the Durham Region closely, and almost every house coming to market is fully renovated. Presumably a reno and sell. When people stop flipping homes, and owners stop removing before selling because there is no value… how hard will Home Depot Canada be hit? The consumer products industry at large? Who is going to buy those bland white cabinets with long stainless steel hardware? Who is going to keep manufacturing it? There is so much pain waiting to happen right now. In the US, watching Home Depot for declines in sales is usually a pretty good indicator on the broad market. Unfortunately, we don’t get a Canada specific breakdown from them. Although Canadian Tire is pretty big for housewares, and the past few months haven’t been pretty. We might if it starts to drag on their profits. The US is working on their recovery and can’t let the CA market drag their numbers. HD on NYSE has been dropping since January. and with RBC throwing up big red warning signs to the government in regards to business investment completely picking up and moving to the US… there is almost no way to avoid a recession in future quarters down the road, which will put an even larger damper on the real estate market. With both capital flight from the country, cratering real estate, negative GDP movement, peak debt to income ratio… we’re going to be in for a pretty nasty ride here. I think this is the ugly monster waiting to rear its head. We avoided most of the 2008 collapse, but we did it on borrowed time ($$$). With our economy out of sync with the US, the citizens can’t handle higher interest rates and government can’t handle higher taxes, and doing nothing will sink both. Can someone toss a schmuck like me a bone, and tell me what I’m suppose to see on those change graphs? To my amateur eyes, it looks like GDP is beginning a down cycle, but I have no idea tbh. I’m sure you’re seeing what most people see, just remember you won’t be able to see everything on a single chart – especially just a growth chart. What you should get is a reason to look into something a little more. 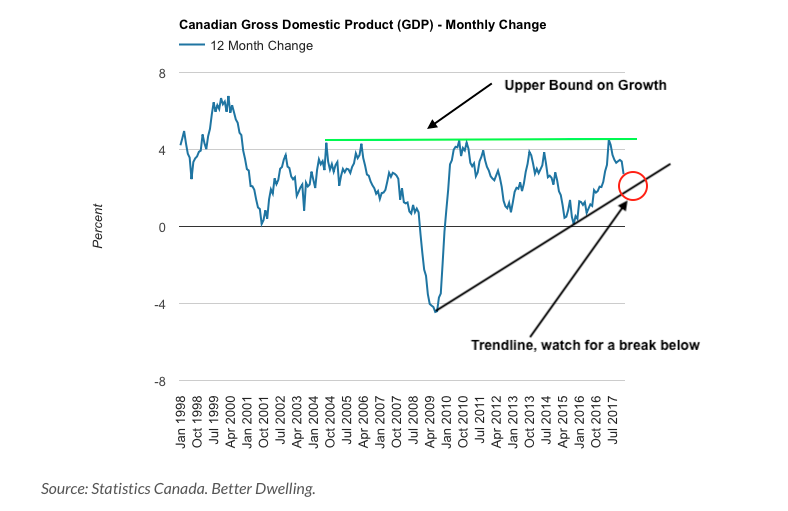 – upper bound shows “maximum” typical growth in Canada.” It can’t/won’t/usually doesn’t/go higher than this. When it hits it, it usually drops. – trendline is the upward trend. Looking at monthly isn’t useful, you want to see that there’s a general uptrend being continued though. – It’ll likely break below the trend line, but when is a bigger question. I know one of the writers does technical analysis, and thinks this drags on until 2019. I think if we’re seeing the decline now, it might happen a lot faster. As they pointed out, January declines were followed by recessions the other 2 times it’s happened. Graph 1: GDP, this graph shows a nearly unabated growth since 1997, the beginning of the last cycle. Noting a blip in 2008, but had completely recovered by 2011 on relatively the same trajectory. Graph 2: GDP change, this basically just shows the first data point of decline. Could be nothing, or it could be huge. Time will tell. Graph 3: RE Industry GDP $, again unabated growth since recovery of last cycle. Small dips happen as you can see. Will this time be different? Time will tell. Graph 4: RE Industry GDP %, same as Graph 3 but expressed in percentage. You can see a lot more noise in the graph. Drop looks big but because of the last year’s positive numbers, it could be a normal decline before proceeding higher. Time will tell. Graph 5: RE Industry GDP profit, unless realtor commission % goes higher, this will decline with a market decline, much the same as it will increase as prices increase unless realtor commissions go lower. Lol, Stats Can blames B-20 for declines that haven’t had an opportunity to take full affect. Was shaking my head when I read this last week. January would have been pre-approvals from December. No impact should be noticed until at least March, possibly longer. Well my boy, it has been brought forward by a quarter. Tick tock. Some pre-approvals were extended to 120 days. Expect full impact effective May and going forward. This gets augmented by the January rate increase as those who were pre-approved prior to this date will see their ~3% pre-approvals expire and have to renew for around 3.19% or more. Not a huge jump for large downpayments, but significant for those with high ratio mortgages (sub-20%). 3 more rate hikes in the next 6-8 months. If people with mid-tier credit can borrow under 4% (5yr,fixed)by the fall it will be a miracle. The rest of the mortgages renewing next year will be in the low 4s and stress tested in the 6 range. 3x the rate some of these people paid when the music was still playing. And anyone renewing this year was most likely in the high 2% range maybe even lower…2.34% to mid-3% is a huge leap. Borrowing increase of 50%. Have to give it up to BD. A lot of people called a market crash and recession, but few people can explain it or give realistic timelines. It looks like it’s happening, and the banks are completely wrong about it. They really should be hiring you guys to give REAL advice, not spin. I first heard about BD in Maclean’s, and I bookmarked the piece. I send it to everyone that tries to explain that prices can continue to rise forever. I wish the government had acted earlier than it did. And I wish we as consumers can collectively be rational. Majority of these problems are self-inflicted due in some part to government’s lackadaisical attitude and partly to consumers’ irrationality. Unfortunately, when it hits the fan, no one is completely spared. I wonder what will happen to the thousand of units around me where people invested to gain immediate profilt? Most of them will be ready in the next 3-4 months :). I see a lot of pre assignment sales being offered through kijiji, MLS and realtors although most are yet to offer them for a loss but quite a few willing to let go at the price that they bought them for. This is only deny stage one. The number and reason does not make sense. How could it be? Where are we going from here? Who is going to buy those shiny brand new houses? Well, this is man made disaster. Not by foreign buyer, not by developer, not by the trades people, not even by the house flipper. It’s by the socialist government we elected at Ottawa, Toronto and Victoria. By their collective policy to manage housing affordability. By the socialist media. I mean doesn’t it really surprise you when developer and flipper are slowing under this political and social climate? You are the reason I had to change my user name from C to CS. You dont make any sense. You left out the “socialism” on the way up. You know, the socialism for the developers, builders, realtors, speculators, bribe-taking politicians. Where is your anger for the central banks that held interest rates down for much, much too long in order to create a bubble? Where is your anger at the Canadian central bank bailing out the banks in 2008 to the tune of $125 billion? Where is your anger at the federal government allowing amortization periods to go from 25 to 30 to 35 to 40 years in order to keep the game going? Had banks actually had to hold these bad risks on THEIR books, there is no way in hell that they would have taken these people on. No way. But they’ve done it because their risks have been socialized. How about all of the programs and policies enacted by federal, provincial and municipal governments that have kept the bubble going? “No problem, we’ll just increase immigration. We’ll instigate programs for rich foreign buyers. We’ll look the other way on money laundering and not declaring any income. We’ll hold public lands back in order to keep prices up. We’ll allow owners to turn their homes into Airbnb in residential neighborhoods. We’ll stand by and watch as existing citizens are priced out by corrupt foreign money buying up homes and then leaving them empty, hoping for capital appreciation. I could go on and on, but I hope you get my point. Socialism for the rich has existed all the way up this overblown bubble, and now when some good people are trying to stop the madness, they’re suddenly called “socialists”. This bubble was engineered and manufactured deliberately, with intent, and it surely wasn’t the “free market” that did it. There was nothing “free market” about it because the governments and the central bank manipulated the market at every turn. Oh snap. Took him to church. Anyone else wanna take a crack?